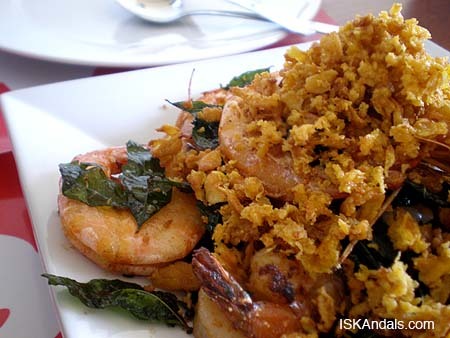 Last week, it was a spur-of-the-moment thingy when I cooked Malaysian buttered prawns. Nagkataon lang meron akong prawns. And I saw Chef Peter’s YouTube video, first time I ever saw a recipe of it online as Iive been trying to get hold of it since I left Southeast Asia ages ago. I wasn’t prepared; no curry leaves (kaya spring onion nailagay ko hehehe) and the egg floss didn’t look right. Sumakit na kili-kili ko sa kahahalo kailangan ng praktis. But tastes good! I said to myself, di bale I’ll do better next time. Now that’s Malaysian Buttered Prawns Take Two. A lot better than the first batch I made, especially with the yummy, crispy curry leaves (I used to think they’re sili leaves hehehe). The egg floss still didn’t look quite right. Dismaya ako ng konti at hindi ko makuha ang tamang itsura ng egg floss. The egg bits should look thin and hair-like, which I still couldn’t perfect. But what the heck, taste divine exactly the way it should be! Check out the recipe from Chef Peter (thank you so much!) and here is how I did mine. Well, not much difference and I passed on the cut chilies. Using kitchen scissors, cut the prawns’ back, tail intact, and devein. Wash, drain and pat dry. With a spatula stir in the beaten egg yolks in a circular motion. The yolks will start to froth and when browned but not burnt, remove and drain on a colander. Press with your spatula to get rid of excess oil. Set aside. Wipe your pan clean and heat enough oil to deep-fry the prawns. Deep fry for about half a minute or more or until cooked (not more than a minute). Drain and set aside. Wipe the pan clean again, heat about 2 tablespoon of vegetable oil to melt about 2 slab of butter. When just heated but not smoking hot, fry the curry leaves (and chilies if you have) for about a minute. Add sugar and salt and keep stirring. Then pour in milk and mix together. Turn off heat. Throw in the prawns and mix until each prawn is all coated lovingly with the mixture. Serve on a platter topped with egg floss. Enjoy! .-= Cecile’s last blog ..FTF- Pineapple =-. .-= Luna Miranda’s last blog ..Carpaccio di Salmone =-. .-= vernzs last blog ..Euro Bakers Pasta =-. interesting way to cook buttered prawns! am sure masarap yan! pahinge …. lol. how I wish I can cook prawns in here but it’s not allowable. I can eat outside only to a non-kosher restaurant..
I’m sure that taste crispy and succulent.. di ba sis? .-= charmie’s last blog ..Bihon Guisado =-. Btw,I don’t know if you know that I featured your lamb chop last week. .-= FoodTripFriday’s last blog ..FoodTripFriday68 =-. di rin kaya mahirapan din ako nito. the recipe is worth trying though. it has been a while since i posted a comment in your blog. but i am an avid fan. i love your blog, specially the photos. makes me really hungry! .-= hungrynez’s last blog ..Baked Chicken in Cream =-.